As part of the world’s oldest cruise line, P&O Cruises Australia is attached to a certain prestige, and has developed a reputation for excellence over its long history. Despite its small fleet of three ships, no other cruise line can claim to offer as many sailings in Australian waters as P&O – making it the go to cruise line for many Australian holidaymakers. If you’re interested in cruising with P&O Cruises Australia and would like to find out more about what they have to offer, check out our in-depth cruise line guide below. Originating from the passenger division of the Peninsular and Oriental Steam Navigation Company (a British shipping and logistics company founded in 1837), P&O Cruises Australia was created to offer a reliable, year-round cruise service for Australian holidaymakers travelling to New Zealand and various islands of the Pacific. In 1932, P&O Cruises became the first cruise line to offer passenger routes to Australia – a move which would ultimately lead to the creation of a separate fleet solely dedicated to transporting Australian passengers. The Australian arm of P&O was referred to as P&O Cruises for many years, before Australia was added to give the brand a more standalone identity. Sixty years later and P&O would de-merge all of its cruise ship operations, creating a whole new company called P&O Princess Cruises. This leisure line was independent of P&O and consisted of several fleets – including P&O Cruises, P&O Cruises Australia, Princess Cruises, AIDA Cruises, Ocean Village and A’Rosa Cruises. In 2003, P&O Princess Cruises merged with Carnival Corporation, creating the world’s largest cruise company. In the subsequent years, several ships were added to the P&O Cruises Australia fleet, one of which Princess Cruises’ Regal Princess. After extensive refurbishment, Regal Princess entered the P&O Cruises Australia fleet as Pacific Dawn, and made its first sailing under this moniker in 2007. In 2008, Carnival Cruises ended operations at Ocean Village – a UK based cruise brand the corporation took on during its merger with P&O. 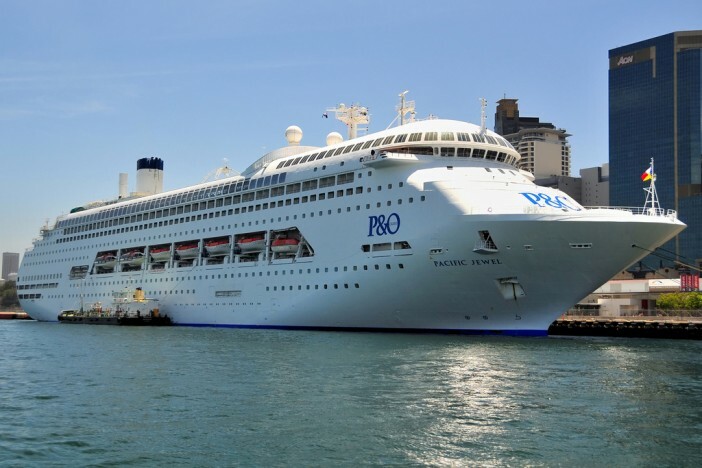 After the closure of Ocean Village, two of its ships – Ocean Village and Ocean Village Two – joined the P&O Cruises Australia fleet, making their debut sailings as Pacific Dawn and Pacific Jewel respectively after a one-month refurbishment period. After seven years with P&O Cruises Australia, The Pacific Sun made its final sailing on 1st July 2012 – leaving just three ships in the P&O Cruises Australia fleet. In its lifespan, it’s though The Pacific Sun carried over half a million passengers to the Pacific islands. In 2014, Carnival announced that two Holland America vessels would be transferred to the P&O Cruises Australia fleet, bringing the line’s total number of ships to five. Thanks to a fun, relaxed approach to cruising, P&O Cruises is a popular choice for a variety of guests – from couples and families, to solo travellers and large groups. The P&O fleet offers something for everyone, including a multitude of children’s entertainment, fantastic dining options and luxury cabins that prove the perfect place to relax and unwind. Whatever your age or preferences, a P&O cruise promises an unforgettable holiday. Despite being made up of hand-me-down ships, the P&O Cruises Australia fleet offers everything the discerning cruise passenger should require from their vessel – from excellent on board dining to a fabulous range of entertainment. Here, we take an in-depth look at the P&O Cruises Australia fleet to find out exactly what facilities each vessel has to offer. Built in 1991, Pacific Dawn was previously owned by Princess Cruises, at which time it was known as Regal Princess. The ship joined P&O Cruises Australia in 2007 after a month-long refurbishment – adding 2,052 passenger capacity to the Australian fleet. Dawn features 795 cabins in total, including 10 accessible cabins for wheelchair users and those less mobile. Beyond the cabins, Dawn has a three-storey atrium, casino, 9 bars, 2 restaurants, whirlpool spas and a duty-free shopping centre. Passengers may notice the ship’s distinctive profile, which was designed exclusively for Princess Cruises by Italian architect Renzo Piano. After changing hands on several occasions between a number of different cruise lines, Pacific Jewel entered service with P&O Cruises Australia in 2009 and has remained with the cruise line ever since. At 70,310 tonnes, Jewel is P&O Australia’s biggest ship, and features a similar profile to Pacific Dawn – having been designed by Renzo Piano. The vessel features 834 standard indoor and outdoor cabins – 198 of which offer a private balcony. In terms of amenities, Jewel has a wide range of entertainment venues, including an aerial stage for circus and musical performances. The ship also offers a total of six dining options, eight bars, two swimming pools, a library, casino and the biggest health spa and fitness centre of any ship in the P&O Australia fleet. After the closure of Ocean Village brand in 2008, Ocean Village was stripped of its vibrant livery and transferred to the P&O Cruises Australia fleet, where it was rebranded as Pacific Pearl. Making its debut sailing towards the end of 2010, Pearl offers New Zealand and Australian itineraries from Sydney and Auckland respectively. Built in 1987, Pacific Pearl received extensive renovation before its maiden voyage, with several state-of-the-art innovations added to bring the ship into the 21st century. With 11 passenger decks, 793 cabins, nine different bars and several high-quality restaurants – including Salt Grill by Luke Mangan – Pacific Pearl offers fun, relaxation and food for every passenger. P&O Cruises Australia offer more Australian cruises than any other cruise line – with year-round cruises to New Zealand and the Pacific departing regularly from Sydney, Brisbane and Melbourne. Whether you want to lounge on the powder white beaches of the Isle of Pines or explore the wild, natural beauty of New Zealand, no other cruise line offers such a fabulous array of cruise itineraries in Australian waters. Think P&O Cruises Australia could be the cruise line you’ve been looking for? Then visit our P&O Cruises Australia page, where you’ll find a comprehensive selection of upcoming cruise holidays with P&O Cruises. Should you require further assistance, don’t hesitate to give the experienced Cruise1st Australia team a call on 1300 857 345. Images Sourced via Flickr Creative Commons and P&O Cruises Media Center. Credits: Lee Gilbert, Yanxin Wang and P&O Cruises.